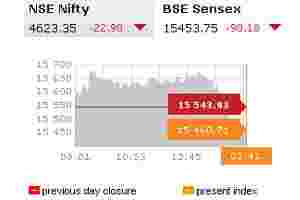 New Delhi: Shares rose on Friday after three days of losses as positive data from the United States helped allay concerns about the global economy, but the market was on course to log its first annual fall since 2008. Top lender State Bank of India rose more than 1% after a newspaper report said the finance ministry has proposed to inject about Rs15,000 crore to Rs16,000 crore ($2.8 billion to $3 billion) into about 15 state-run banks including SBI by March. “Today being the last trading day of the year, I don’t expect selling pressure to come in as many fund houses will try to protect their NAVs," said K.K. Mital, head of portfolio management services at Globe Capital Market in New Delhi. The net asset values of mutual funds have taken a beating this year, with the BSE index down nearly 24% since the start of January. The benchmark is the worst-performing major equity index as stubborn inflation, high interest rates and slowing growth took a toll. Foreign funds have been net sellers of about $380 million worth of Indian shares this year, a far cry from the record net investment of more than $29 billion in 2010. By 10:40 am, the 30-share index had pared some gains to be up 0.55% at 15,629.17, after falling 2.7% over the past three days. Twenty-three of its components rose. Bank stocks were also helped by hopes for a cooling in headline inflation, which will allow the central bank to ease monetary policy. The Reserve Bank of India kept rates unchanged at a policy review this month after raising 13 times since early 2010. Data showed on Thursday annual food inflation dropped for a ninth straight week to its lowest in nearly six years in mid-December. The headline inflation has stayed above 9% for a year through November. The sector index was up 0.79% and the ICICI Bank, the country’s second-largest lender, rose 1.7%. Top software services exporter Tata Consultancy Services gained 1.1%, while Infosys Ltd rose 0.7% after the US data on Thursday pointed to positive trends for the world’s biggest economy. The United States contributes more than half of the revenue for Indian software services companies. In the broader market, there were 849 gainers for 453 losers on total volume of about 110 million shares. The 50-share NSE index was up 0.5% at 4,669.45. Asian stocks nudged higher with sentiment helped by the positive US data. The regions stocks have collectively lost about a fifth of their value this year as natural calamities and financial turmoil took a toll on the risk appetite of investors. • Godrej Properties Ltd gained as much as 3% after the company sold a 49% stake in a unit developing a project in Gurgaon near New Delhi to private equity firm Sun-Apollo India Real Estate Fund LLC. • Network18 Media & Investments rose 6.5% after the company said its board would meet on 3 January to discuss raising funds on rights basis for growth plans and to repay debt.